Steven (Chicagoland, United States) on 15 November 2010 in Architecture and Portfolio. Wing of the Milwaukee Art Museum (MAM) in Milwaukee, Wisconsin. When I first spotted this wing, I thought the spot looked familiar when I was told that it was where a commercial was filmed for Lipitor. superb shot.. like the softness. Love the shape of the place, love the architecture. Hi Steven -First,thank you so much for your kind comment on the Veterans Day post I did..that was nice. 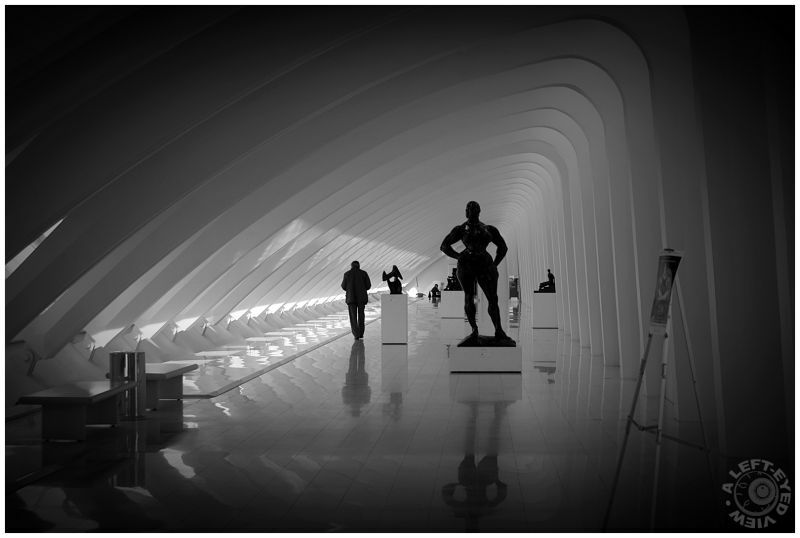 Now, I think you know I am a big fan of Left-Eyed View ..your work is marvelous...but these last two from the Milwaukee Art Museum (BTW what marvelous architecture, isnt it?) these two have been in another dimension again....you have conveyed these so beautifully! The lighting in this one and yesterday's are just perfectly done and I love your perspective...your perspective is always so excellent and dramatic....OK enough groveling, but I DO love your work and I mean it when I say that these are just fantastic.. Have a great week Steven! Beautiful B&W and amazing place! Whatever the history, this sure makes a wonderful exhibition space . . love the effect of the shape that seems to touch the mind as much as the eye. Now I will have to study that commercial better! Excellent b&w shot! @¨‘°ºO Dutçh Oº°‘¨: Unfortunately those commercials have gone bye-bye thanks to "Doctor" Jarvik. Here's a New York Times article on Pfizer's decision to drop him. What a shot! Wonderful perspective and composition/treatment! Love this! 5*****! A very cool space and interesting art and light. It is very interesting,Thank you for sharing this to us! It sounds like an amazing & beautiful race (kinda wish I'd run it, too). Glad the weather held for you. Wow.. fabulous !!!!! I do not have right words to say how much I love this compo . Great building and very nicely captured. Your work is worthy of the exhibit. Belle photo d'architecture en noir et blanc.